With children heading back to school, many of us have found our shopping list has grown to include healthy school lunches and snacks, and the trendiest new outfits for our children. Adding those items may push your household budget to the max – and in some cases go over what you wanted to spend…until now. Coupon clipping is the answer to smart savings on everyday needs and your back-to-school necessities. With some quick study, you’ll be combining manufacturer coupons with store sales to maximize savings in no time. Once you start seeing those dollars go back in your pocket, the term “crazy coupon lady” won’t seem like such a bad thing. Newspapers: Your local paper, such as The Record, Star-Ledger, and community newspapers, will often have coupon inserts and circulars that offer pages of savings. Websites: Coupons, Retail Me Not, and Passion for Savings are popular and comprehensives sites for all items. You should also visit manufacturer’s websites for specific deals on the items you frequently purchase. Apps: To save on groceries every time you walk down the super market aisles, make sure you have iBotta, Checkout51, and Grocery iQ on your phone. Also download apps from major grocery chains, such as ShopRite, Acme, and Whole Foods, for store savings. In-Store: Speaking of specific retailers, join loyalty programs and scan shelves for member savings and to receive coupons at checkout for future purchases. We recommend creating a cheat sheet with all the products and brands you regularly purchase. By doing so, you will cut down on search time, minimize unused coupons, and maximize your rewards. Keeping a filing system in place is key to successful couponing. When it’s finally your turn in the checkout line, frantically flipping through all your little pieces of paper can be a bit overwhelming and will probably cause you to miss one or two savings opportunities. Shoeboxes, storage containers, binders, or a coupon wallet are all inexpensive options to keep your stash updated and organized. 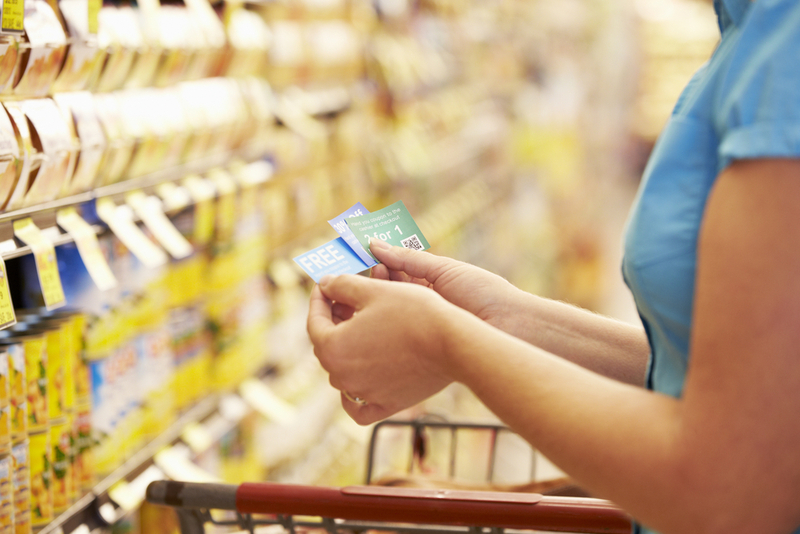 How you choose to sort coupons is up to you, but commonly used methods are by grocery category, aisles, expiration dates, brands, stores, or products. Keep your “filing system” next to you as you clip coupons. You’ll organize them immediately, ensuring that they’ll be there when you need them in-store. Before you enter the store, pull out the coupons you plan on using to streamline your checkout process. Refresh regularly; an expired coupon helps no one and it clogs up your file system. If you rely on a retailer’s app, review it before you enter the store. Make sure you check the digital coupons that are relevant for your visit, so you save time and money at checkout. Still unsure of how to start your coupon journey? Don’t worry, check out this quick start guide created by The Krazy Coupon Lady, of course! From groceries to clothing to household items – coupons have no limitations. They can lead to savings so large that top-shelf products may ultimately cost less than store brands. Putting together the perfect lunch for your kids can be easier and cheaper than ever with the brands you know and trust. A quick search on coupons.com can provide deals for Yoplait yogurt, General Mills fruit snacks, Big G cereals and many more. And, your kids can carry their discounted lunches in style with 20% off backpacks and lunch bags at most manufacturers’ websites. How much you save depends on the time you’re willing to dedicate to the fine art of couponing. By using websites such as couponmom.com or hip2save.com, you can plan your shopping carefully and match your coupons to a store’s sale to secure the best deal. Money Crashers shares their story of spending only $1,238.63 on $7,580.30 worth of name brand groceries, toiletries, and cleaning products. That’s $6,341.67 worth of savings (84%) without sacrificing quality on any purchase! Imagine what you can buy with those savings, especially at back-to-school time. There is no reason to feel shy or embarrassed for clipping coupons. They exist to be used. Trying to save more money doesn’t make you cheap, it makes you smart. With time, organization, and patience you’ll master the art of couponing. Learn more about how you can save on your back-to-school shopping in NVE’s blog post, Keep Back-to-School Spending Under Control. NVE Bank provides products and services to help you save money, reach financial goals and more. Visit www.nve.bank or visit one of our neighborhood branches to speak with one of our Branch Associates. You can also call us at 866-NVE BANK (683-2265) or connect with us online. This entry was posted in saving money and tagged "back to school shopping", "Back to School", budget tips, coupon clippling, coupon tips, coupons, saving money, saving tips. Bookmark the permalink.